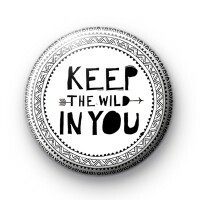 This black and white 1 inch pin badge is very Boho . It has the text Keep The Wild in You which is written in a very cool and relaxed. This is a fun festival vibe badge.